Sharekhan have gained high credibility through people's trust and value in our services and products. This credibility extends to you when you join hands with us. A partnership does not merely carry the backing of a leading financial services company but also the guidance of a friend and the advice of a mentor. Brand : Sharekhan,India's financial services company with top of the mind recall in the investing population across India. Technology : A customer centric focus on technology has helped us stay ahead with pioneering product launches like TradeTiger. A fully automated advanced risk monitoring system supported by an integrated back office support ensure smooth transactions. Research : In an information-centric business like ours, knowledge makes all the difference. We deliver quality and in depth research. Best Business Practices : With customer interest as the core value, best practices and directives from regulators help in building greater trust and transparency. Training : Comprehensive training for the business partner & their employees at the nearest branch. Marketing Support : Facilitating business development by client level events/activities for your outlet. Better local visibility and higher leverage on the brand. Acquire and service self trading online clients. Achieve large scale business success with the entire product bouquet offered by Sharekhan from your own Share Shop. 2. New or existing dedicated Business owner interested in offering all products and services from Sharekhan. 1. Customized offerings for servicing HNI clients. 2. Range of products and offerings to suit individual client profiles and service supported with dedicate relationship managers. 3. Scalable Internet based business model to service a large client base. 4. Dedicated RMs for Equity sales, Risk Monitoring and Operations related issues. Equities : Help your customers an informed investment decision based on Sharekhan product and research support. Derivatives : Participate in the F&O segment through in depth research and product support on both futures as well as options strategies. Commodities : The fastest growing segment with a potential to become multiple times of the current business. Commodities trading is imperative to grow ones business and with our membership with MCX and NCDEX we are able to provide one of the most comprehensive and competitive platform. Currency : The Currency Derivatives allows you to trade on the movement of conversion rate of USD / EUR / GBP / JPY with INR. Currency derivatives indeed commands the largest derivative market across the world. With Sharekhan you can provide trading options to all your clients with online monitoring and surveillance mechanism. Portfolio Management Services (PMS) : Avail of our multiple portfolio management schemes designed to meet the growing needs of your HNI customers. The schemes are based on the risk-return appetite of your customers. PMS ProPrime is aimed at long-term investors focuses on steady returns and PMS ProTech focusing on absolute returns in the stock market. Mutual Funds & IPO's : Give your customers the freedom to choose from over 30 fund houses while buying or redeeming mutual funds and booking IPOs online. SIP or Top Picks : Secure recurring investments from customers by suggesting regular, fixed investments with a Systematic Investment Plan in the Equities or Mutual Funds of your choice or follow the Top Picks basket recommended by our Research team. With Sharekhan, the systems software and processes to run my day-to-day business are simply wonderful. There is system monitored risk management and business support to grow my business. Any support is just a call away. "With its ethical functioning and compliance driven processes, Sharekhan keeps us and customers fully confident about its Integrity. Everyone is so responsive to help us grow the business"
Sharekhan is awesome. Rare combination of powerful online tools & software’s, ethical business practice and 100% SEBI compliance. Thorough professional approach to business with a personal touch gives us a comfort of own family. Transparency & timely pay-outs gives us & clients the comfort of business dealing. Easily approachable top executives for quick resolutions. I m proud to be Sharekhan business partner. Sharekhan’s feature rich terminal & charting tools has won the heart of our customers & has helped me & my business grow manifolds. This would not have been possible with the excellent training & operational support extended by Sharekhan. For an entrepreneur, timely payments matter the most & Sharekhan has never disappointed me. Thank you for the excellent support! 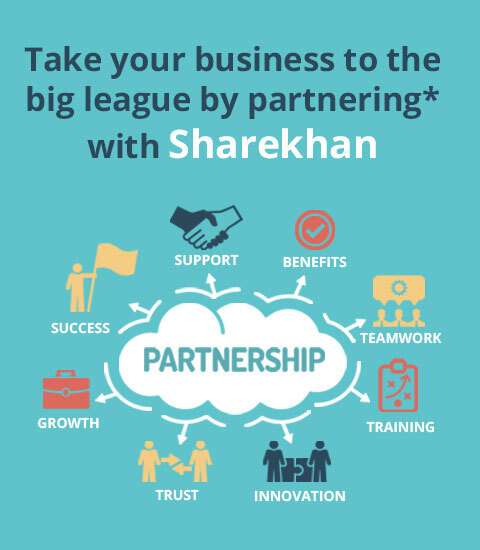 Want to Partner with Sharekhan? Copyright 2010 · SHAREKHAN FINANCIAL SERVICES PVT. LTD. · All rights reserved. Registered Office: Sharekhan Limited, 10th Floor, Beta Building, Lodha iThink Techno Campus, Off. JVLR, Opp. Kanjurmarg Railway Station, Kanjurmarg (East), Mumbai – 400042, Maharashtra.